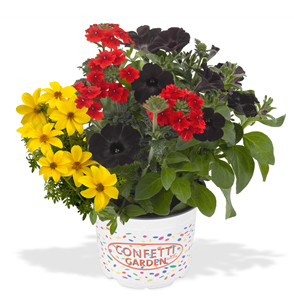 Our Confetti Garden™ ‘Oktoberfest’ Combination is a remarkably striking mixed planting featuring the vibrant red of Empress® Flair Red Verbena, the golden hues of Bidens Bidy Gonzales Yellow and the unique, attention-grabbing, velvety black of Sweetunia® Black Satin. And if that isn’t enough, even the individual characteristics of their foliage come together to make this a combination planting sure to stand out. Our Oktoberfest combination will tolerate full sun to light shade (>6 hrs. of sun) and has a mounding, trailing habit, growing 12-20-inches high and wide. The plants in our 'Oktoberfest' plants are grown and shipped in fine quality growing medium and are guaranteed to arrive alive and ready to thrive.